There's no question that this has been a rough year for Paul McCartney. He and his late wife Linda were extraordinarily close, and the former Beatle has had an understandably difficult time coping with her death. As has been the case throughout his career, McCartney has sought solace through '50s rock 'n' roll, and his latest effort Run Devil Run stems from his recent period of mourning. At first glance, it might appear as if McCartney has merely created a throw-away collection of long-forgotten oddities. However, this could not be further from the truth. Each of the 15 tracks contained on Run Devil Run is tackled with an extreme sense of urgency, and the energy of the studio sessions radiates beautifully through the music. To record the collection, McCartney wisely kept his song choices to himself until his band, which included Pink Floyd's David Gilmour and Deep Purple's Ian Paice, had joined him in the studio. Consequently, each track sounds fresh and vibrant, not at all unlike the early Beatles' albums. For Run Devil Run though, McCartney leaves the tracks with all the rough-edged, rawness of an open wound. Adding to the intensity are three new songs written by McCartney — Try Not to Cry, What It Is, and the title track — each of which fits quite well with the rest of the cover selections. As a result, McCartney creates a cohesive album that links his entire career — from The Beatles to Wings to his solo albums — with the music he grew up listening to in the '50s. In other words, Run Devil Run has a brilliant and powerful current of circularity, which drives home the point that there is still plenty of creativity and zest left — a most welcome statement indeed! 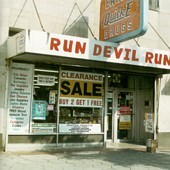 Run Devil Run is available from Barnes & Noble.